Day 7 12th/April Sunday: Volcanic mud pools, Mt. Aso, Kusasenrigahama, Kumamoto handy craft center, raw horse meet, puffer fish sashimi. We are alive! Today, the first place we visited was "The Blood Pool"
It was red probably because of the plentiful iron oxide. Japanese call it "Blood Hell". That explained why the devil was around. Turning back, I saw Suan See talking to the fishes. Then we left for for another famous mud pool. As we walked in, these flowers welcomed us. This place is called "Sea Hell". As you can easily imagine, the pool here is blue in colour. The steam was abundant at times. I found some new movie talents. Do you know some one was keeping a close watch? Then we found this lotus pond, with lot's of beautiful tropical flowers, including orchids. This film will be nominated for Oscar award soon. 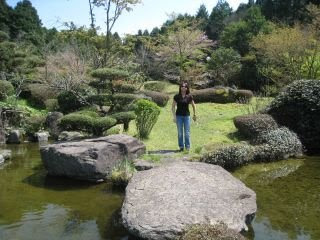 On our way down, we stopped for lunch in this nice little Japanese style restaurant. The window commands a good view of a very pretty garden. However, as we were hungry, many did not realise it's existence. 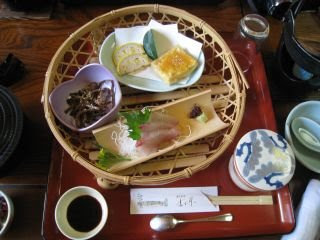 Well, it was a light, healthy Japanese lunch. Not much meat...... :( Not to the likings of my brothers. After lunch, we headed towards Mt. 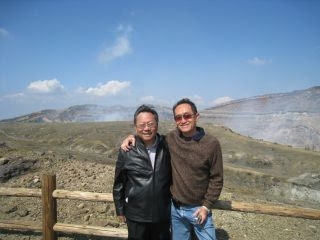 Aso, the biggest live Volcano in Japan. 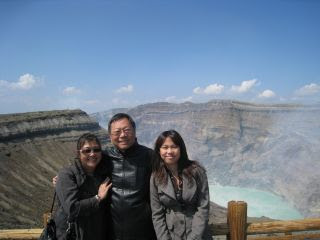 At a height of 1592 meters, it has the world biggest caldera. This was where we boarded the cable car. Surrounding slopes of Mt. 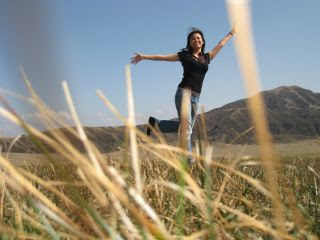 Aso had hardly any vegetation. #8 and my family took a long walk up this place, where the wind was indeed, very strong. You can see the huge caldera here. As we descended from Mt. Aso, we passed by this place called 草千里ヶ浜, which means "field where you will find grass growing for a thousand miles, without any trees". A professional photographer was seen snapping away with a model posing with various postures. This photo was voted " Best picture" of the year. Nice angle, pretty model, and you know who was the photographer lah! We then visited "Kumamoto Handy Craft Center", where some bought interesting local souvenirs. It sits next to the black Kumamoto Castle, in contrast to the white 'Himeji Castle' we visited earlier. Dinner was a real adventure in this nice Aoyagi restaurant. 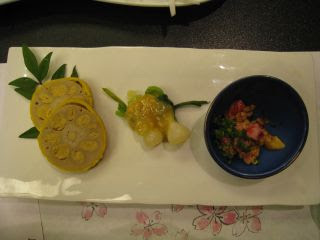 Many did not like the lotus roots as they were filled with too much wasabi. This was raw horse meat salad. It was crunchy, and did not carried any smell we feared. Texture was like taking "rare" steak. We could easily identify the tenderloin, fillet, and liver on the plate. When asked, we were told that the white slices were from the neck of horses. #6 took almost a piece, I took 2, uncle took 1 Cheurn Howe swallowed 3, while Tsih Ern enjoyed all the 5 pieces, including those meant for the parents. Many others tried too. Ask Tsi Ern how it taste? 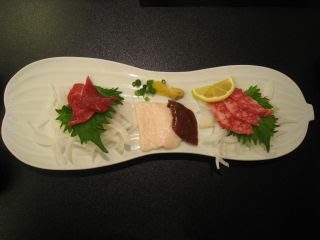 It was not until towards the end of the dinner that we found out that they were " raw horse fat" OMG! Some internal organs must be removed or else.......that will the end of our trip! I assured my brothers that if there were one place on earth we could try puffer fish, it's Japan! 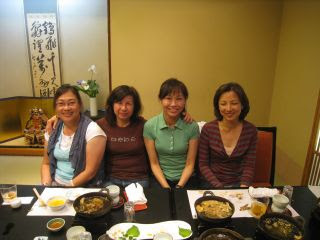 Yet when the 'fugu sashimi' came, my brothers insisted that I should eat first, and should I still breathe after 5 minutes, then only they will eat. This is my third attempt, and it was still very exciting. Everyone claimed that it was excellent! Nothing was spared for this puffer fish. Some of the meat and skin were fried and cooked. Even the bones were fried, crispy like crackers. 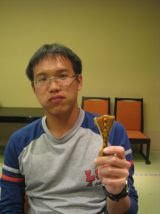 Choon Howe snatched this last piece, even though his mouth was still filled with earlier pieces. 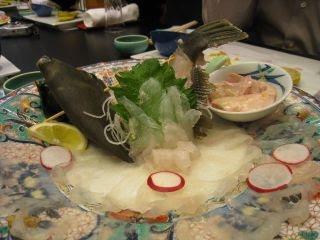 We also had others kinds of live raw fish. We were told to put the white soft staffs in the bowl in the soya sauce, and then use it for dipping. It is called 'Shirako'. I kept quite and everyone ate with a little frown. Folks, Shirako is actually the 'sperm sac' of fish. It's filled with sperms!!! and this fish too, but nothing tricky this case. But nothing beats puffer fish! Technically speaking, mass continuous laughter is a symptom of pre-'Puffer Fish Poisoning'. 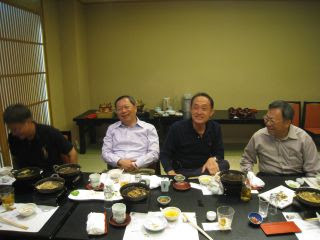 However, those who laugh till they wet their pants will survive, and emerge stronger than before.